Prequels should be the most painless type of movie to write. Start with a beloved character/world/concept and tell the story that got them to the point where they/it became beloved. Sure, there’s little to no tension in these stories- the audience already knows the broad strokes of the ending. And, your audience is already predisposed to liking the prequel story as they liked the original at least enough to greenlight the prequel in the first place. And, when you base your story on a book series that is so old it’s lapsed copyright…the whole affair seems like a no brainer. character conflict. That’s also an option. 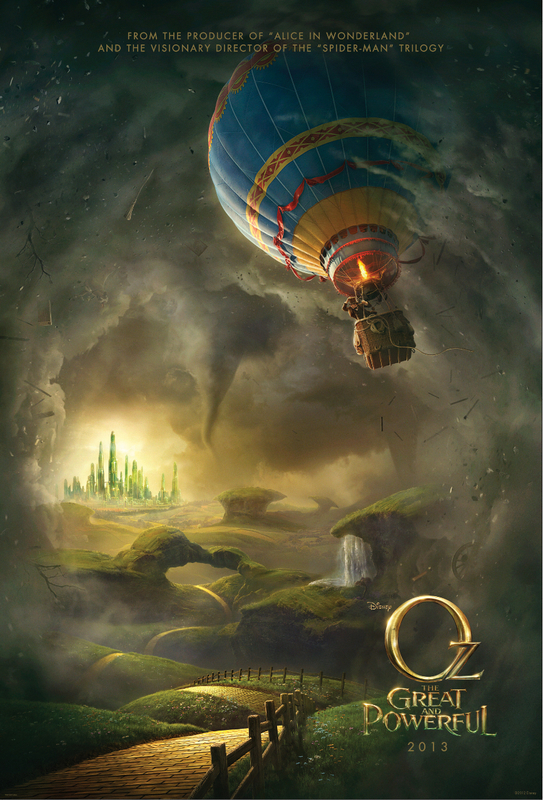 It’s not that “Oz the Great and Powerful” is a bad movie, it’s not- and it goes without saying that it’s absolutely GORGEOUS- but it’s so enormousnessly predictable, as it’s a prequel to 1939’s classic “The Wizard of Oz”, that all of the manufactured tension is erased. Our story centers on how the wizard of Oz (James Franco) came to be. Turns out he was a conman-esque carnival magician in Kansas that was swept away in a tornado to the magical land of Oz. Once there he dupes the people into believing he fulfills a prophecy to save their world. He also meets three witch sisters; Theodora (Mila Kunis), Evanora (Rachel Weisz), and Glinda (Michelle Williams) who factor into his adventure in their own ways. And, like the original, pay attention to the Kansas scenes our characters dual roles. The biggest issues with this film is how long it takes Oz to get to the “heroic” state you know he is eventually headed to. Long scenes of self-doubting monologues, other characters buffing his confidence, and wavering pad out the film’s runtime. Yes, we eventually see how these characters came to be where we see them at the beginning of “The Wizard of Oz” but I feel as if were this movie written backwards- starting at the original and projecting back from there- as opposed to, my guess, being written with the ending in mind that dovetails, then some of the arduous plodding could have been excised. As to the predictability, on the one hand that can’t be entirely avoided. But on the other, there is potential for new story here- as author Gregory Maguire’s “Wicked” series has already proven. The story of the witches had particular potential which was fairly wasted as it became a well trod love triangle. Then a rather large amount of story is devoted to new secondary characters (Zach Braff’s “Finley” and the completely CG “China Girl”) and their relationship to our “hero”. Characters that are completely original to this story. Why?